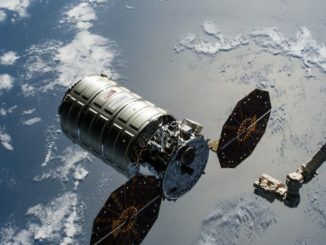 A huge U.S.-built, Canadian-owned communications satellite weighing 15,600 pounds, the heaviest spacecraft of its kind ever launched, is mounted to a Falcon 9 rocket for liftoff early Sunday from Cape Canaveral on a heavy-lifting mission that previously would have required SpaceX to throw away the launcher’s first stage booster. The Telstar 19 VANTAGE spacecraft is set to kick off a 15-year mission beaming broadband services across the Americas, and connecting airline passengers to WiFi over the North Atlantic Ocean. Liftoff of the satellite atop a SpaceX Falcon 9 rocket from Cape Canaveral’s Complex 40 launch pad is scheduled for a four-hour window opening at 1:50 a.m. EDT (0550 GMT) Sunday. There is a 60 percent probability of favorable weather during the launch window. The chief concern is that afternoon and evening thunderstorms could linger late into the night, violating the thick cloud and cumulus cloud weather rules. Sunday’s mission will be the second flight using SpaceX’s upgraded Falcon 9 Block 5 first stage, the latest generation in a series of step-by-step enhancements intended to boost the launcher’s performance, while introducing changes to allow the booster to be easier to recover and reuse. 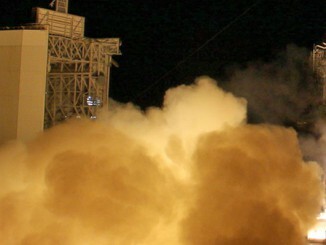 SpaceX launched the first Falcon 9 Block 5 rocket May 11 with Bangladesh’s first communications satellite. Officials heralded the successful debut as pivotal in allowing SpaceX to reduce the time and money needed to turn around a recovered booster for another mission. Elon Musk, SpaceX’s founder and CEO, told reporters in May that a Block 5 first stage could be flown 10 times with little changes other than refueling, and up to 100 times with more significant refurbishment. At the time, Musk said SpaceX plans to re-fly a Falcon 9 first stage as quickly as 24 hours after its previous mission as soon as next year. The enhancements include a beefed-up thermal protection system to better shield the rocket against re-entry heating. SpaceX introduced new black coatings on the interstage and landing legs, and the Falcon 9’s first stage engine section, or octaweb, is bolted on to the vehicle in the new configuration, rather than welded to the first stage. 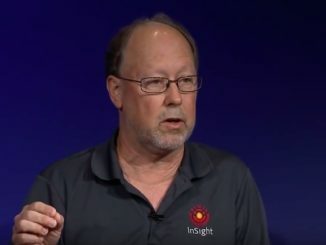 He said the nine Merlin engines on the Falcon 9 Block 5 rocket can generate 8 percent more thrust at sea level, up to around 190,000 pounds of thrust each. The Merlin engine on the Falcon 9’s second stage also received a performance upgrade. Since the first Falcon 9 Block 5 mission in May, SpaceX has launched three Falcon 9 flights using a mix of new Block 5 upper stages and reused Block 4 first stages. Sunday’s mission will be the second employing all-Block 5 hardware. The extra lift capability of the Falcon 9 Block 5 will allow the rocket to send the nearly 15,600-pound (7,075-kilogram) Telstar 19 VANTAGE satellite toward its operational perch in geostationary orbit more than 22,000 miles (nearly 36,000 kilometers) over the equator. The flight plan calls for the Falcon 9’s second stage to fire its engine twice, then deploy the Telstar 19 VANTAGE payload into an elliptical, egg-shaped transfer orbit with a low point a few hundred miles above Earth, and a high point ranging tens of thousands of miles in altitude. Following the company’s standard policy, SpaceX has not released the exact parameters of the orbit targeted on Sunday’s mission. Other commercial launch providers typically publish such data in advance of their missions. The Falcon 9 Block 5 will give the communications satellite, owned by Ottawa-based Telesat, a high-altitude lift while its first stage still retains enough propellant to return to a SpaceX drone ship parked in the Atlantic Ocean a few hundred miles east of Cape Canaveral. Hauling such a heavy satellite toward a high-altitude geostationary transfer orbit would have required earlier versions of the Falcon 9 to devote all of their first stage propellants toward the launch, leaving insufficient leftover fuel for descent maneuvers. The Falcon 9’s first stage reignites a subset of its engines to target landings at sea or on land, then extends four landing legs while using its center engine to brake for touchdown. The extra engine restarts require extra fuel, eating into the mass the Falcon 9 can send into orbit. Sunday’s launch will be SpaceX’s 13th mission of the year, and the 58th flight of a Falcon 9 rocket since the first version of the launcher debuted in 2010. SpaceX will try for its 26th rocket landing Sunday. 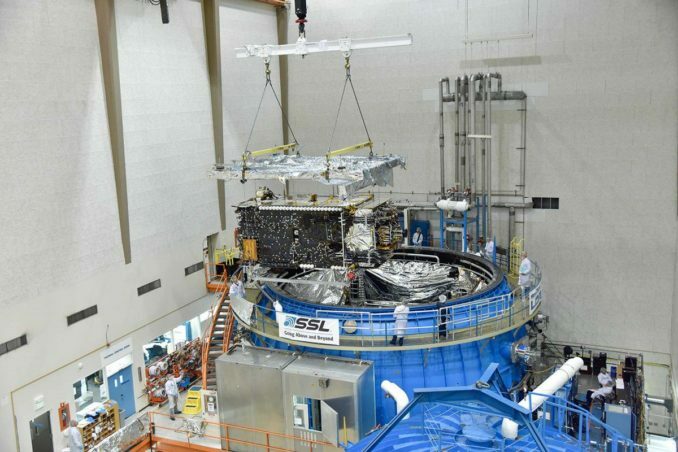 Manufactured by SSL, formerly known as Space Systems/Loral, in Palo Alto, California, the Telstar 19 VANTAGE satellite is the first of two SSL-built, Telesat-owned telecom craft set for launch on Falcon 9 rockets this summer. The Telstar 18 VANTAGE satellite is scheduled for liftoff from Cape Canaveral on another Falcon 9 flight no earlier than Aug. 17. Telstar 19 VANTAGE will become the heaviest commercial communications satellite ever launched, eclipsing a record set by the TerreStar 1 telecom spacecraft, which weighed 15,234 pounds (6,910 kilograms) when it rode an Ariane 5 rocket into orbit July 2009. 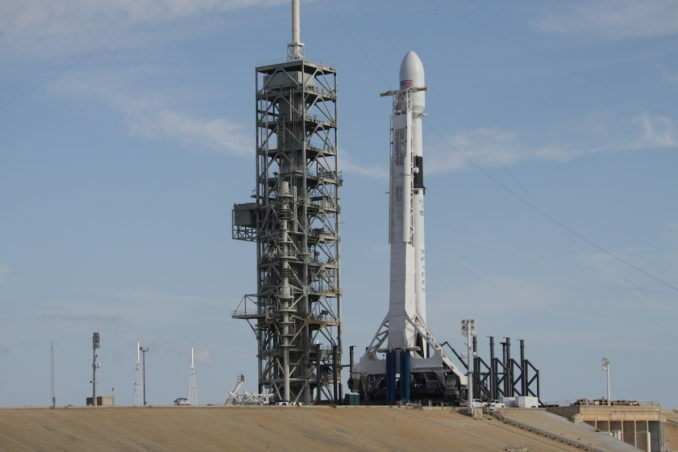 It is also set to be the heaviest satellite ever launched by SpaceX into geostationary transfer orbit, the drop-off for most commercial telecom payloads. Telstar 19 VANTAGE will use its own hydrazine-fueled engine to circularize its orbit after separation from the Falcon 9 rocket, climbing into a circular geostationary perch nearly 22,300 miles over the equator at 63 degrees west longitude. In that position, Telstar 19 VANTAGE’s orbital velocity will match the speed of Earth’s rotation, allowing it to hover over a fixed geographic point. Once the satellite unfurls its power-generating solar wings and communications antennas, Telesat will bring the newest member of its fleet into service by late August, a company spokesperson said. 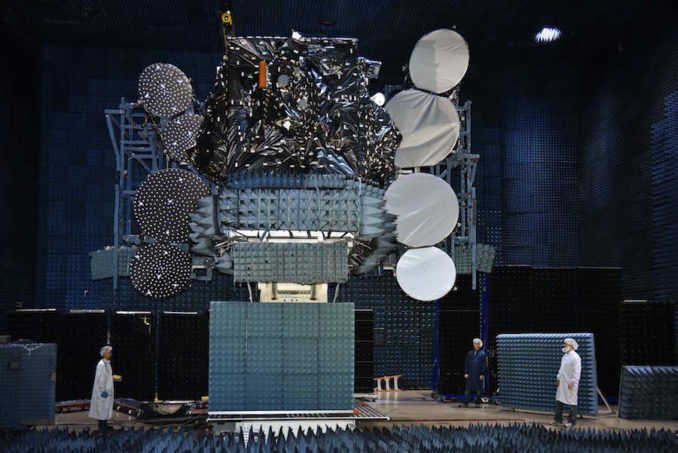 Telstar 19 VANTAGE will operate in the same geostationary slot as the Telstar 14R satellite deployed in 2011, which encountered a failure in one of its solar arrays shortly after launch, diminishing its capability. Telstar 19 VANTAGE carries Ku-band and Ka-band payloads, with coverage extending from Northern Canada to South America for broadband connectivity. The new satellite will also provide airborne Internet services for aircraft traveling on trans-Atlantic routes between North America and Europe. Goldberg said about a third of the new satellite’s Ku-band communications capacity has been pre-sold.